This is a 70 year old male with unexpected colonic perforation following laparotomy. 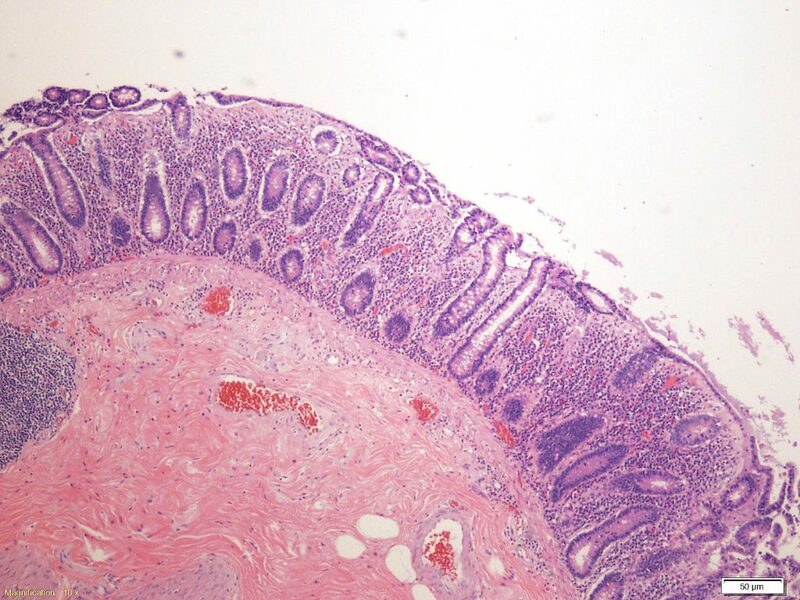 Histologic Description: While the area of perforation demonstrated prominent granulation tissue, the surrounding bowel demonstrates increased lamia propria plasma cells, along with increased intraepithelial lymphocytes with epithelial damage. Close inspection reveals that the subepithelial basement membrane is thickened, and has an irregular border with the underlying lamina propria. 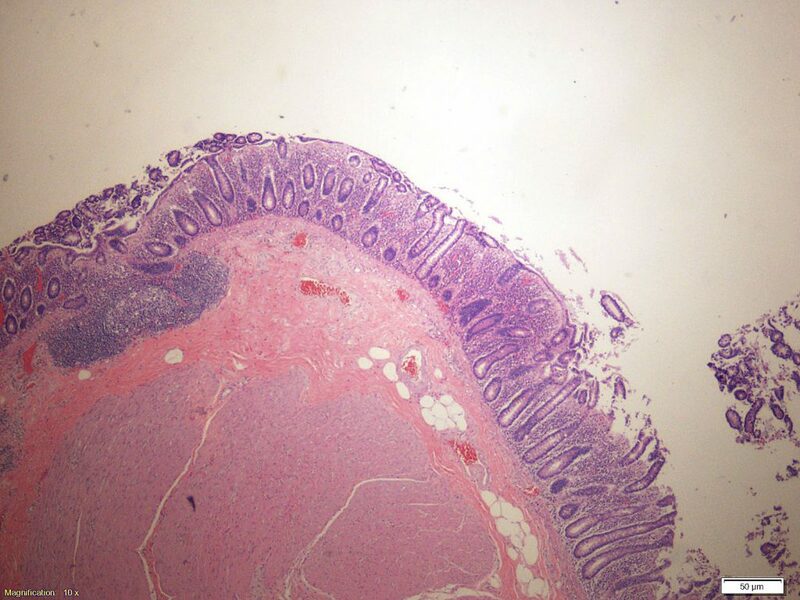 These are the typical features of collagenous colitis. Differential Diagnosis: Ulcerative colitis would be associated with more prominent crypt distortion and frequently active colitis. 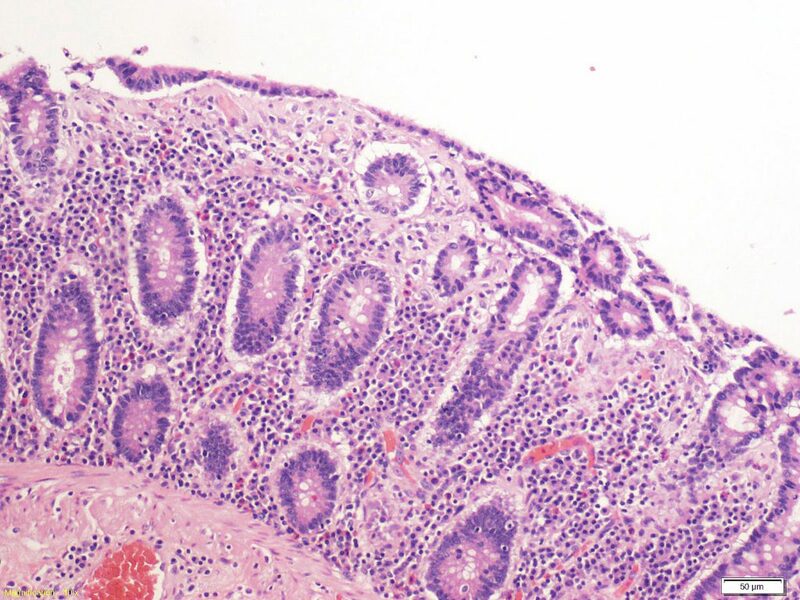 Infectious colitis would typically have an active colitis pattern, and would lack the prominent intraepithelial lymphocytes of the current case along with thickened basement membrane. Lymphocytic colitis is very similar to collagenous colitis in that both are microscopic findings seen in patients with watery diarrhea whose colonoscopies are grossly normal, but it is distinguished by the absence of a thickened subepithelial basement membrane.